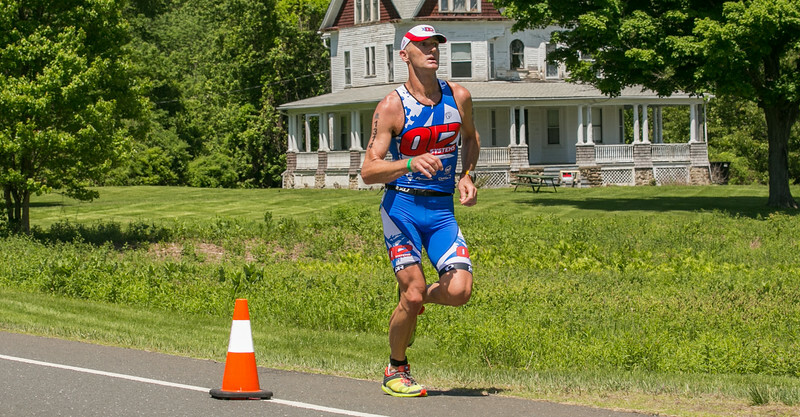 This past weekend the picturesque countryside of Middlebury became a world class triathlon venue. 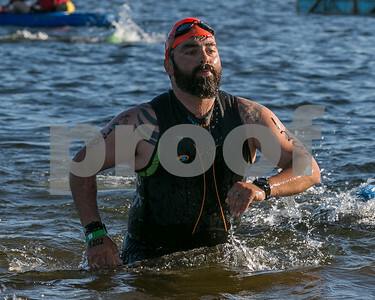 Lake Quassy Amusement Park hosted The Revolution3 Triathlon, a two day event featuring an Olympic distance triathlon on Saturday and a Half Ironman distance triathlon on Sunday. Over 600 people competed in Saturday’s Olympic distance race (1 mile swim, 25 mile bike, 6.2 mile run) and over 700 people competed in the Half Ironman distance race (1.2 mile swim, 56 mile bike, 13.1 mile run) on Sunday. While most participants were from New England, New York, Pennsylvania and New Jersey, the event attracted athletes from as far away as Quebec and Utah. The weekend’s events were put on by Rev3Tri, a Virginia based race production company that operates several similar events in the eastern United States throughout the year. The company is known for the high quality of their events. “It’s better than an Ironman” said Connecticut based triathletes Jarrod and Heather Neeley of Canton. Combining three different sports that require water to swim in, closed roads to ride and run on and a large parking lot and transition zone somewhere in between it all, triathlons are the logistical nightmare of many a race director. 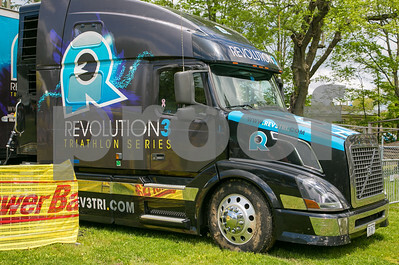 Rev3Tri tackles the challenge with truck loads (literally) of state of the art equipment and precision organization. For the Lake Quassy event the company brought two semi trucks full of gear along with an assortment of other vehicles and equipment. Rev3 utilizes computerized chip based timing systems to track competitors and generate results. While chip timing is not unusual in the racing world these days, Rev3′s system does go one step further than most as it is integrated with their athlete database. 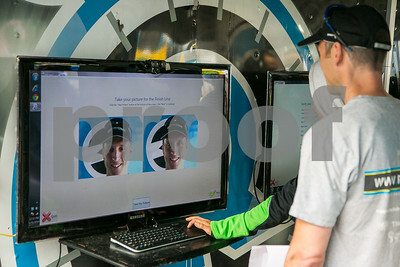 This allows them to leverage some innovative solutions such as computerized athlete check in kiosks and a giant video screen in the finish area that displays a picture of each racer as they cross the line. Almost every piece of gear that Rev3 brought was emblazoned with the Rev3 logo which had the overall effect of temporarily transforming the already colorful Lake Quassy venue into “Triathlon World”. 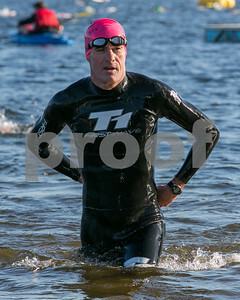 Each race was split up in to multiple age group based start “waves”. 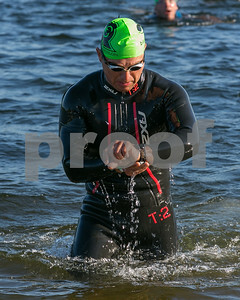 With the large number of participants on hand it took approximately half an hour for all the waves to get underway on the course. 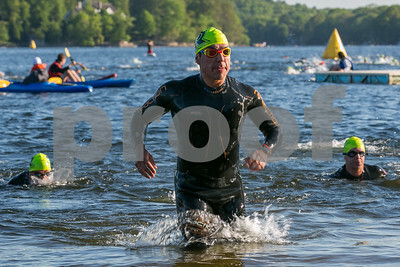 Due to the rolling hills that are characteristic of the region, the Revolution3 Lake Quassy Triathlon courses are considered very challenging in comparison to other triathlons of the same distance. The run courses utilized the hilly roads near Lake Quassy while the bike courses consisted of loops that stretched into Litchfield county and back. Due to the unusual amount of climbing race times were much slower than usual for the respective distances and fields were well dispersed on the course. By the mid-point on the run courses racers passed by at casual intervals and appeared to be more absorbed in their own personal races against the clock than in dicing it out with their competition. At the finish most competitors were justifiably stoked to conquer the courses’ distances and challenges. Flawless event execution, spectacular scenery and perfect weather were just added bonuses. For many, age group triathlon racing at the Olympic and Half Ironman distances is more about accomplishing personal goals than shaving off seconds for the fastest possible time. Numerous athletes took the time to rendezvous with their families on the sidelines prior to finishing the race and then continued on to cross the finish line accompanied by their kids and spouses. 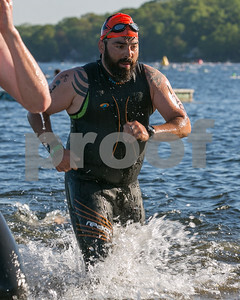 REV3 Triathlon Quassy, Half Ironman distance triathlon held on June 1st, 2014 at Lake Quassy in Middlebury, CT.